This year was Bowden’s first year playing coach pitch baseball. He had a wonderful coach and a great season. He loves playing baseball and is a pretty good player if I do say so myself. B is always so proud of his medals that he gets at the end of each season. And he especially loves seeing his bff S. Maybe one day they will be on the same team! Our play group had a fun time visiting the local strawberry farm this morning. There is a lot of fun stuff to do, and it is super affordable. Because we had a group, we got to do all of the fun activities for only $6 a child! The first thing we did was pick strawberries. Each child got a pint-sized container to fill with berries. C pretty much just dumped her handfuls of food on the animals’ heads. Finally, they each got a small cup of homemade strawberry ice cream. While I did not get a picture, I assure you it was delicious and the kids ate every last bite! Shockingly enough, I actually managed to get a really great picture of the two of them before the activities started. We had a pretty casual Easter as we usually do. I don’t go over the top with the kids Easter baskets. I usually just put a couple of items in that they need, a couple of pieces of candy, and a small toy or two. I am pretty sure I have put shoes in almost all of B’s Easter baskets. So, of course, B was the first one up bright at early to peek into his basket. Check out that mad bed head! About an hour and a half later, C woke up to look at her basket. I love this picture of B looking over her shoulder! 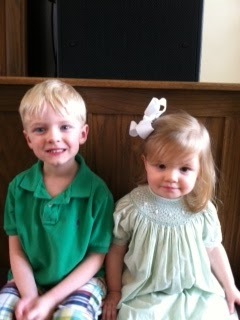 After Easter baskets, we got all dolled up and headed to church. I try to get a family picture in the back of the church every year. The last two years I have forgotten and the picture has been in some other odd location, but this year I actually remembered. So, here we are in all of our Easter finery. We also get pictures with the grandparents and any other family that is present. So the first picture is my family, Uncle J, Aunt A, JuJu and Pop. The next picture is with the Hubs’s family–Grandma and Grandpa. After church and pictures, we went to eat at a local restaurant and had a leisurely afternoon at home. On Wednesday mornings, the kids and I meet with several other moms and preschool aged little ones for some play time and socialization. The kids enjoy playing with each other, and I will admit, I enjoy the 2 hours of adult conversation—even if it is frequently interrupted by demands for juice or arguing toddlers! Today was our group Easter party and egg hunt. We were short a few kiddos, but we still had a fun time. We kept things pretty low key with cookies, goldfish crackers, and juice boxes. One of the mothers brought a set of Resurrection Eggs. Each egg contained an item that symbolized a part of the Easter story. It began with a donkey in the first egg to represent Jesus’s arrival in Jerusalem on Palm Sunday and ended with an empty egg to represent the empty tomb! The older kids were quite spellbound and enjoyed seeing what was in each egg. Since I was elected to open the eggs and tell the story, I don’t have a picture of that. However, I did find a link to site where you can purchase a set a Resurrection eggs here. While the kids were eating, I went out and hid the eggs. After doing our little Resurrection Egg lesson, we took the kids out to hunt. We managed to snap a couple of group pictures before releasing the hounds. And of course, the best part of the egg hunt, and getting back inside and checking out what kind of candy you got in your eggs. C immediately started chowing down on a small bag of Skittles while B had to empty every egg and select the best candy. Like his mother, he is not much of a sour or chewy candy person, but he loves chocolate. And he hit the jackpot—someone had put Hershey Kisses in their eggs! Overall the kids had a blast. And the mommies had fun too! In an effort to make things a bit more special around here, I decided to do a mildly green themed breakfast for St. Patrick’s Day. 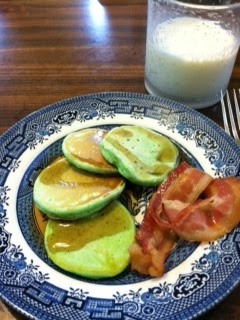 So we dined on green silver dollar pancakes, bacon, and milk! B kept calling them “cookie pancakes” because of their size and odd color and honestly had a hard time eating them. After breakfast, I made sure everyone was decked out in some green to avoid any pinchers before heading out to church. I also learned that if St. Patrick’s Day falls on a Sunday, I am in trouble. I guess I don’t wear much green to church. So, I found a green cami to wear under a brown dress, and I was good to go. So, happy St. Patrick’s Day from our kiddos!